Opera Software, maker of the popular Opera web browser for desktop and mobile operating systems, launched a new Developer version of Opera 55 recently that includes a redesigned Settings page. The Opera browser is based on Chromium, the same core that Google Chrome or Vivaldi are based on as well. 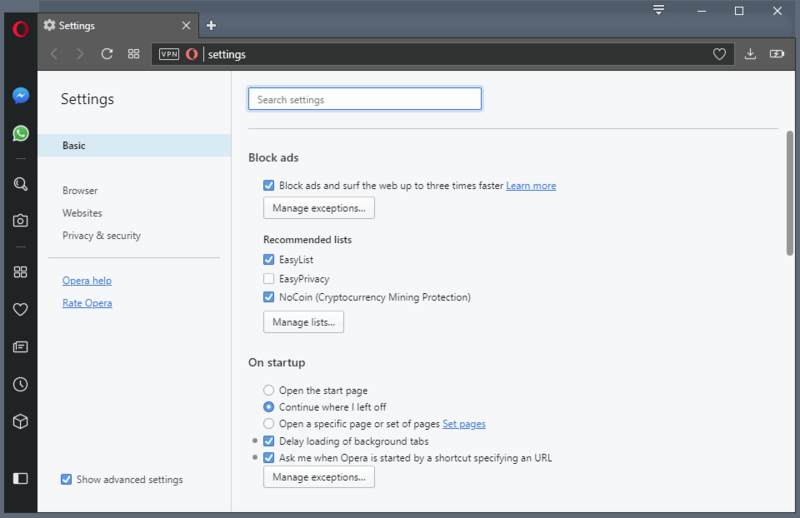 The browser came with a custom settings page ever since Opera Software switched from the company's Presto engine to Chromium. 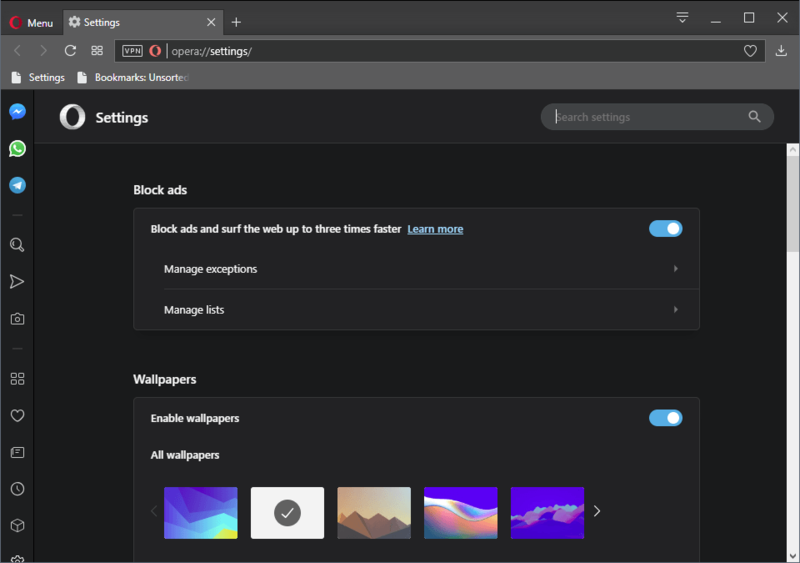 The current stable version of Opera displays all available settings when you load opera://settings in the browser, or use the Opera menu to open the Settings page. It lists basic settings on start and hides some settings by default. You may switch to browser, websites, and privacy & security sections in the settings to customize the browser. The new Settings page that the company launched in Opera 55 changes the layout significantly. It copies Chromes "one page for all Settings" layout and does not hide advanced settings any longer. The new page looks like this (note: subject to change). All Opera settings are displayed on a single page in the new layout. The new layout uses larger font sizes and more whitespace which may improve accessibility but reduces the number of options displayed at the same time on the settings page. Tip: hold down the Ctrl-key on the keyboard and use the mousewheel to zoom in or out of the page. The new layout displays basic settings on load and advanced settings when users select the advanced link at the bottom of the page. Basic settings will appear first when opening the full settings page. Here, you will find settings for ad blocking, wallpapers, browser appearance, the sidebar, synchronization, search engines, making Opera the default browser and startup options. Clicking the “Advanced” label at the bottom will expand the page with additional settings. This includes privacy and security, passwords and forms, VPN, battery saver, My Flow, search pop-up, video pop out, personal news, Opera Turbo, start page, user interface, languages, downloads, system, shortcuts and reset settings. Opera users may restore the old settings layout for now but the option to do so will be removed eventually. Set the preference to disabled. Restart the Opera web browser. The new settings page layout may look prettier than the old but I find it less practicable as it displays less options on the screen at the same time. While it may require less clicking to access settings, it means that users will have to scroll more or use the search instead to manage options in the Opera browser. The change may come to Opera 55 Stable which Opera Software plans to release later this year. Now You: Which settings layout do you prefer, and why? Since “opera://flags/#new-md-settings” is now available in the flags does that mean that Opera now has access to the complete list of flags available in other chromium browsers? For the longest time only a small subset of flags were available in Opera. Just curious. Terrible regression. Opera has been reliably desktop-oriented so far, but this accursed mobile-first wave has finally caught up with them. I assume this is because Chromium is removing the non-Material Design settings page from its core, right…? Wasted space is right, and one has to wonder why a browser designed for the desktop needs so much space?? After all touchscreens have never taken off and tablets are dying off as well. Its all in the name of dumbing down everything for users I guess. I’ve tried Opera a couple times and always felt it was trying too hard to be all things to all users. This is why Chrome wins over so many, because it has basically stayed simple and efficient over time with more under lining improvements then UI. I guess when your market share has always been low and I mean low. What else can you do but keep trying things. The only thing I liked about Opera that made it stand out from other browsers, the fact that it doesn’t look ugly, is gone. Still a loyal Opera fan..